Please remember to vote for us in the blog awards - only a few days left to vote! We had a pie party! 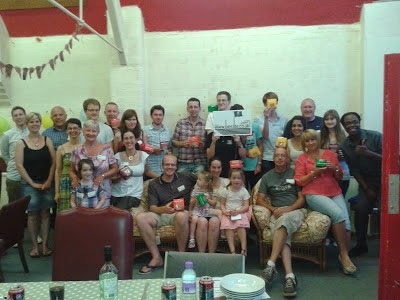 The Pierateers held a big 5th birthday bash, and invited 60 of their pie-loving friends along to the event. There were pies galore, with catering provided by the London Pie and Mash Company, top pie-rizes from Paul's Pies, and some amazing homemade dessert pies brought in by the pie fans! 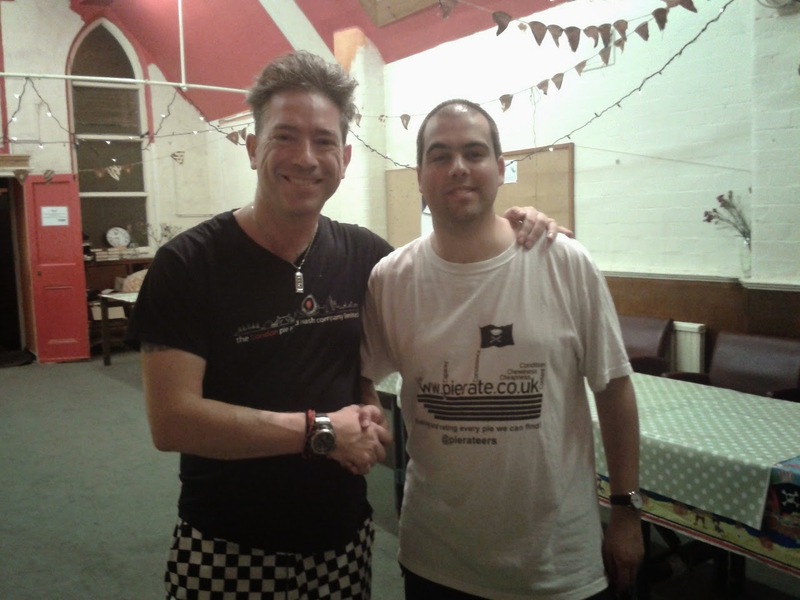 You can read about the event and pies here. 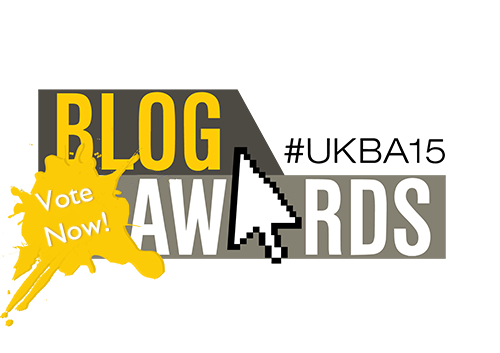 We've been nominated for 2 BLOG AWARDS! And now we really need your votes, for the love of pies!! So please please click both here and here and give us a vote! It won't take 5 seconds! Happy Thanksgiving to all our American readers! You can read our ode to the Thanksgiving pie here. And he's already a confirmed pie-lover on our Celebrities Who Love Pies list, but Barack Obama went one step beyond proving his love for pies by serving up 6 different types of pie for his Thanksgiving dinner. "We go all out on pies," said the president. "We don't play with pie." I'm not mincing my words when I say that Yorkshire-based Lottie Shaw's bakery have concocted a MONSTER of a pie. This gigantosaurus weighs 2 stone and contains a whopping 56,140 calories. Very im-pie-ressive! Would you eat an insect pie? TV presenter Stefan Gates was at Borough Market this week offering a rather unusual twist on your regular mince pie - the mince fly. Alongside the traditional spiced fruit, these pies also contained larvae and locusts, with the aim to challenge people's preconceptions and encourage them to consider other sustainable food sources. continue reading "World's Biggest Mince Pie - Pieday Friday - 28th November 2014"
Americans and many others around the world celebrate Thanksgiving Day, to give thanks for the food they have. Sure, like many festivals these days, the idea of “Thanksgiving” has been somewhat pie-jacked by the media and food suppliers as a chance to sell off more of their turkeys and pies, but we at Pierate HQ can see right through that and still want to retain the original “Thanks” in Thanksgiving. So perhaps you would love to enjoy a pie or two this Thanksgiving and don’t know where to start? Well there is much to learn from the American Pie Council and there are lots of awesome articles and recipes around if you wish to bake your own. Take for example the apple pie recipe by Youtube Chef Caroline Mili Artiss - who has her own Youtube Channel sharing lots of top recipes. This particular recipe can be found on the "indi" website which showcased this apple pie alongside some other goods from this time of year in a competition a few weeks ago and Pierateer Rob went on to bake it for our recent 5th Birthday Pie-rty - another thing to be thankful for as we celebrated 5 years of Pierate just a few weeks ago! The Apple Pie made by Pierateer RAS for our Birthday Pie-rty! Whether it’s Apple Pie, Pecan Pie or Pumpkin Pie in the United States, or even a Turkey Pie like we have in the UK, go on... bake or just eat a pie and share it this Thanksgiving time! 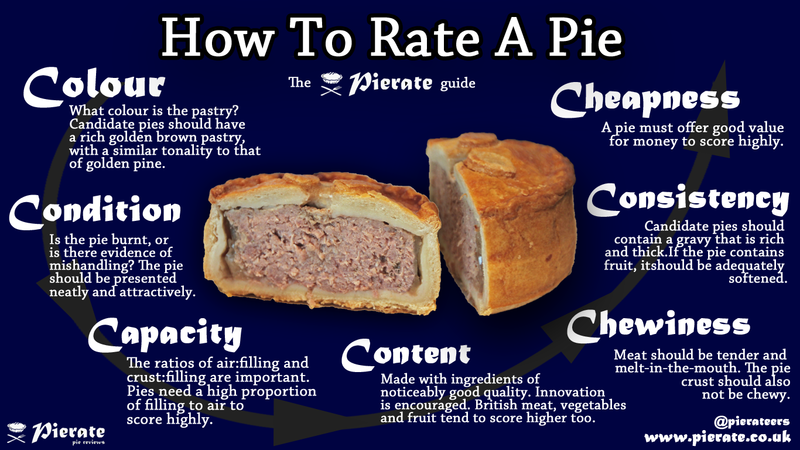 And it you need some ins-pie-ration, why not check out our pie rankings once again! AND WHEREVER YOU ARE, WE WANT TO THANK EVERY SINGLE PIE PRODUCER OUT THERE FOR THE PIES THEY HAVE MADE THIS YEAR AND WISH THEM ALL A VERY HAPPY THANKSGIVING! ENJOY THE PIE!!! continue reading "Happy Thanksgiving 2014!" The pies of the www.pierate.co.uk 5th Birthday pie-rty! 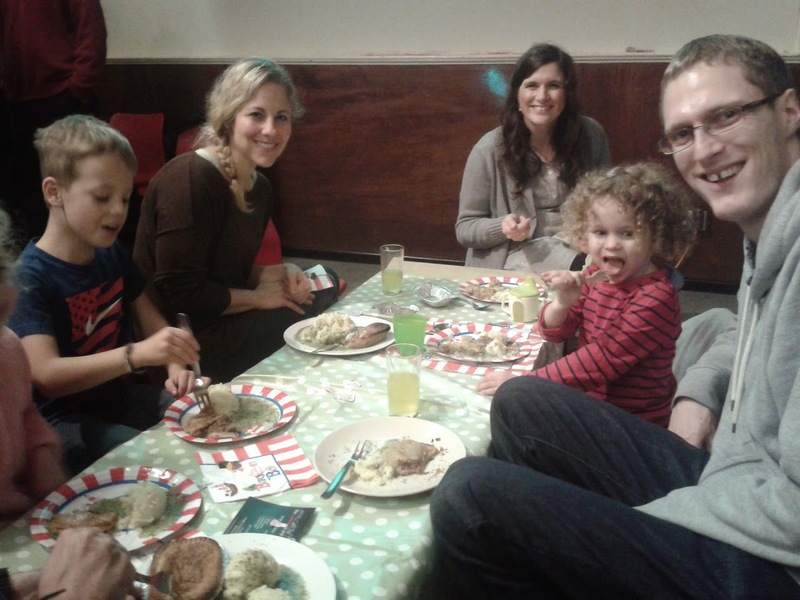 We were absolutely delighted to be able to celebrate less than two weeks after International Pierate Day 2014 with almost 60 guests, who had the chance to enjoy traditional London Pie and Mash for dinner and then rate some delicious home made dessert pies, at our 5th Birthday Pie-rty held in Birmingham. So what were all these lovely pies? You can read about the pie party itself - as opposed to just about the pies that were eaten and rated there - in our "Pierate's 5th Birthday Pie-rty" article! 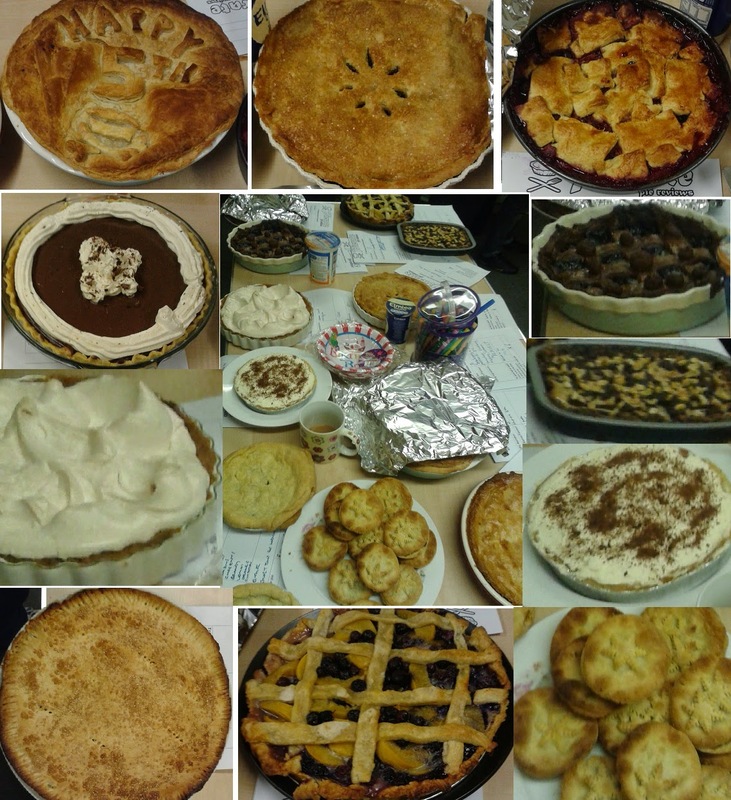 Following in the footsteps of our Pierate Pie Contest 2013, guests had the chance to bring their own pie creations – this time for dessert – with a wide range of pies (and a few “pies”) brought along and thoroughly enjoyed! There was a great selection of dessert pies provided, ranging from the traditional apple and fruit pies to chocolate and cherry and one containing three snickers bars! Naturally the guests were told about the 7 Cs of pie rating and able to give the pies they tried a pie rating! The home made pies of the Pierate Birthday Pie-rty! Thanks once again to all those who brought a home made pie along with them. It was a great selection and people thoroughly enjoyed them! The Pierateers also got in on the act, making a fruit pie for dessert. 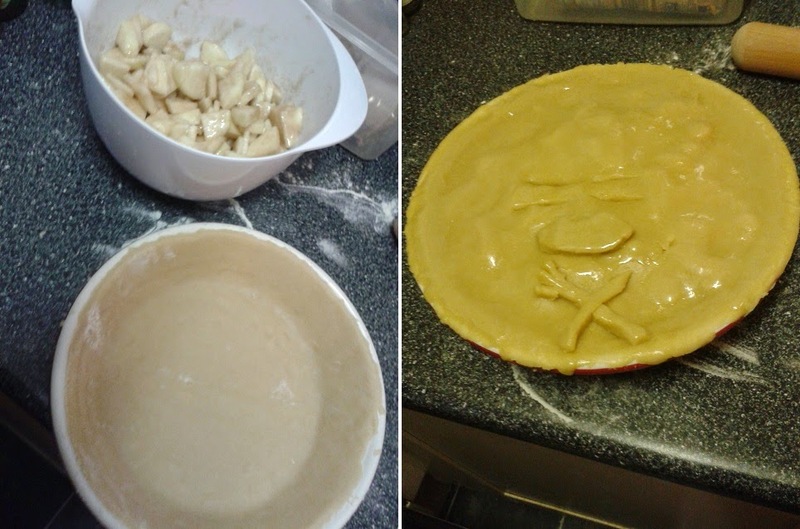 The apple pie Pierateer RAS made was significantly less exotic than the crocodile pie he made a few months ago, which went on to star in the Great British Bake Off: An Extra Slice pie episode in which it was rated by none other than Michelin star winning TV chef Michel Roux Jr! However his fruit pie proved popular with the guests and other friends who tried it. Rob used the apple pie recipe by Youtube Chef Caroline Mili Artiss - who has her own Youtube Channel sharing lots of top recipes. This particular recipe can be found on the "indi" website which showcased this apple pie alongside some other goods from this time of year in a competition a few weeks ago. 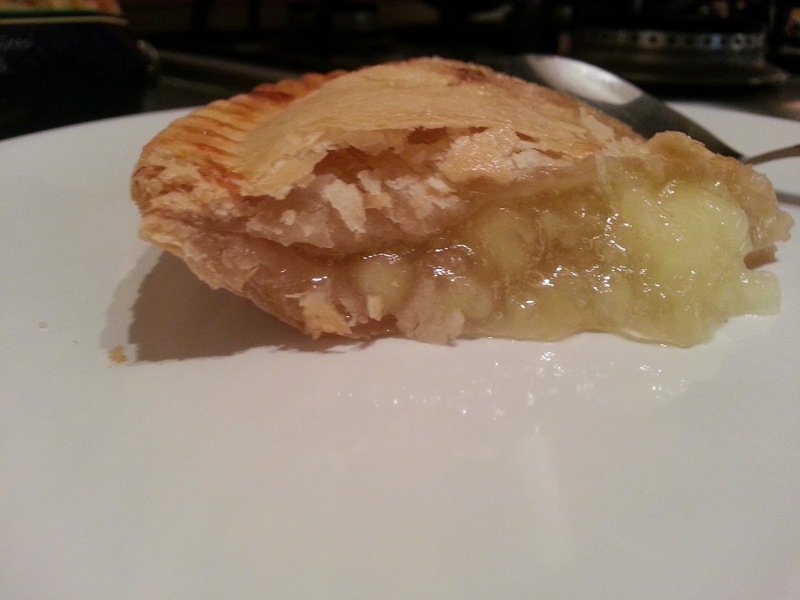 Though let's face it - what could possibly beat a good old apple pie?! While it didn't quite bake evenly, I think I did the pie justice and the additional pastry pie, knife and fork logo is reasonably clear on the top! A very nice, sweet apple pie which has a firm but crumbly crust was very tasty and strong enough to be able to pick up in your hand. And not a soggy bottom in sight - exactly what a Pierateer expects from their pie! 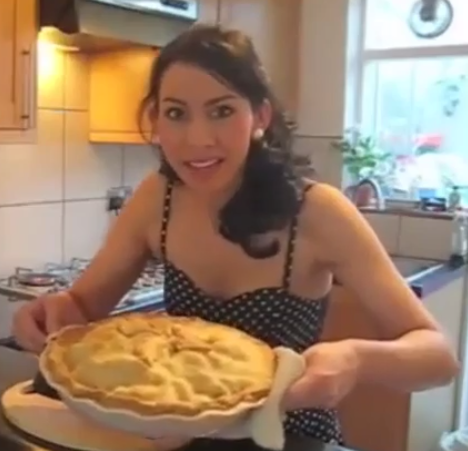 I would definitely recommend you watch the video and give this apple pie a go. Great job Caroline! The Pierateers had organised for dinner to be provided by The London Pie and Mash Company, a relatively new company who are able to cater for parties, festivals and other events. They served up, unsurprisingly, traditional London pie and mash – the name really does give it away! These minced beef pies, mash potato and liquor went down really well with the party guests, and many people enjoyed trying the vinegar and liquor with their pie for the first time. The vegetarian pies were filled with seasonal vegetables and got very good comments from those who tried one too. 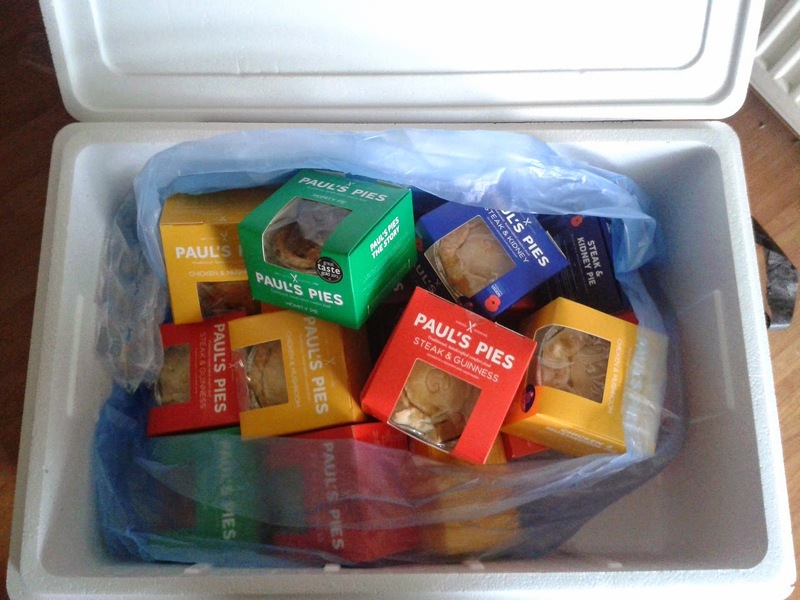 We also can't forget to mention the delicious Paul's Pies we were donated as the pie-rizes for those who had baked a homemade pie, who got to take home one of Paul’s Highly Rated Pies with them as a big thank you! Thanks to Paul’s Pies for providing a big box of their delicious pies! 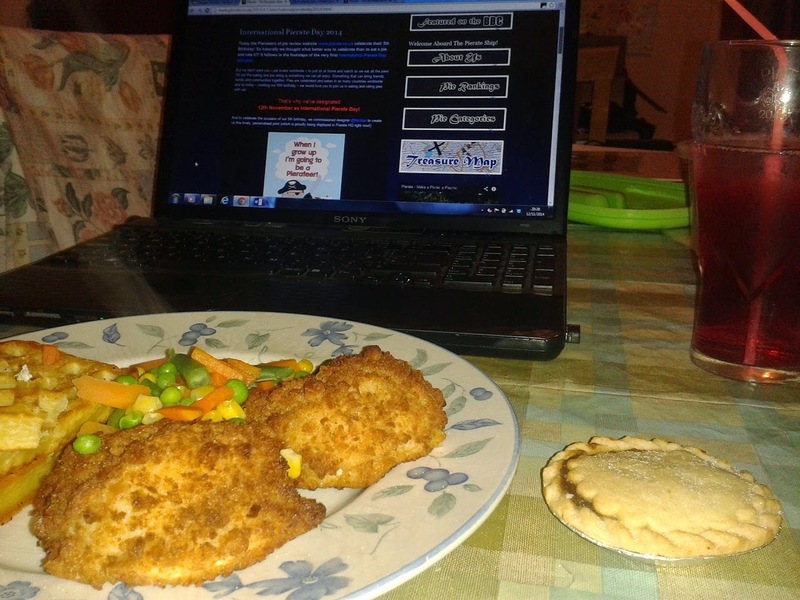 continue reading "Pies at the Pierate Party!" Celebrating 5 years of www.pierate.co.uk with our second pie party/contest! We’ve been talking about it for weeks, but on Saturday 22nd November we completed our ‘Month of birthday surPIEses’ – in celebration of 5 years since www.pierate.co.uk began! 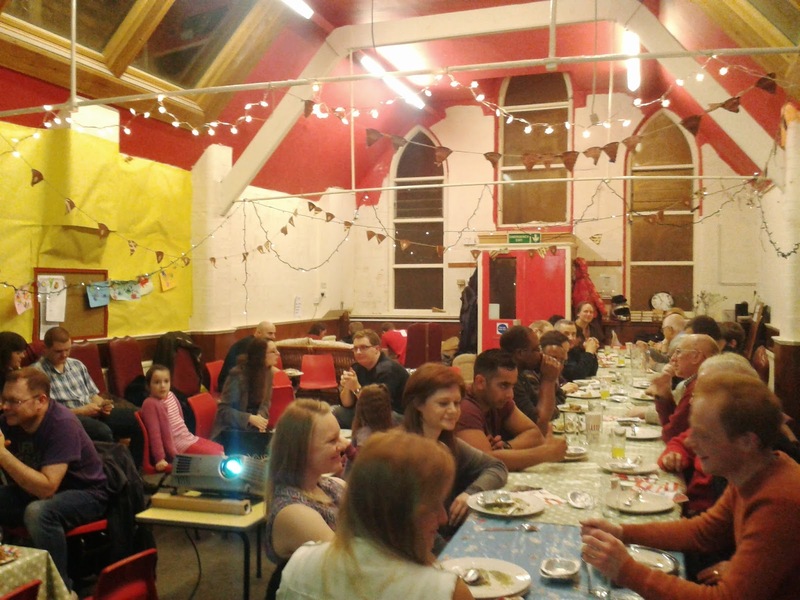 Having celebrated International Pierate Day 2014 less than two weeks ago, we gave almost 60 guests the chance to rate some pies at our 5th Birthday Pie-rty, held in Birmingham. The party kicked off with a big welcome to the many guests who attended as people dropped off their homemade pies and got ready for a fun evening of pie eating and rating. 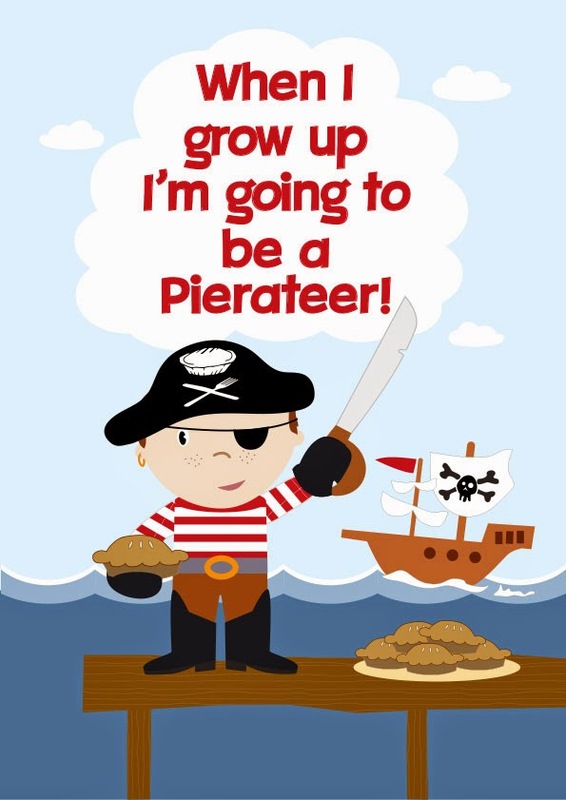 Pierateer RAS kicked off proceedings with a brief “pie-light reel” of some of the exciting developments that have happened aboard the Pierate Ship over the past five years – in particular our various radio and television appearances in the last twelve months and judging at the British Pie Awards 2014. This was swiftly followed by dinner time! You’ll be pleased to know that dinner and dessert pie eating took up the two largest chunks of time in the “pie chart” produced for the evening! The Pierateers had organised for dinner to be provided by The London Pie and Mash Company, a relatively new company who are able to cater for parties, festivals and other events. They served up, unsurprisingly, traditional London pie and mash – the name really does give it away! These minced beef pies, mash potato and liquor went down really well with the party guests, and many people enjoyed trying the vinegar and liquor with their pie for the first time. The vegetarian pies were filled with seasonal vegetables and got very good comments from those who tried one too. You can read about and see more pictures of the pies that were eaten and rated at our 5th Birthday Pie-rty in our "Pies at the Pierate Party" article! All in all the pie party flew by and with a quick game of pass the piecel to end the night on, featuring some delicious Paul's Pies as the pie-rizes, everyone went home happy (particularly those who had baked a homemade pie, who got to take home one of Paul’s Highly Rated Pies with them as a big thank you!) Thanks to Paul’s Pies for providing a big box of their delicious pies for pie-rizes! Pierateer RAS had this to say at the end of the night: "Many thanks to all those who helped in setting up and setting down the venue - I couldn't have done it without you! - and those who brought pies along. It was a pietastic evening of fun with friends and family! 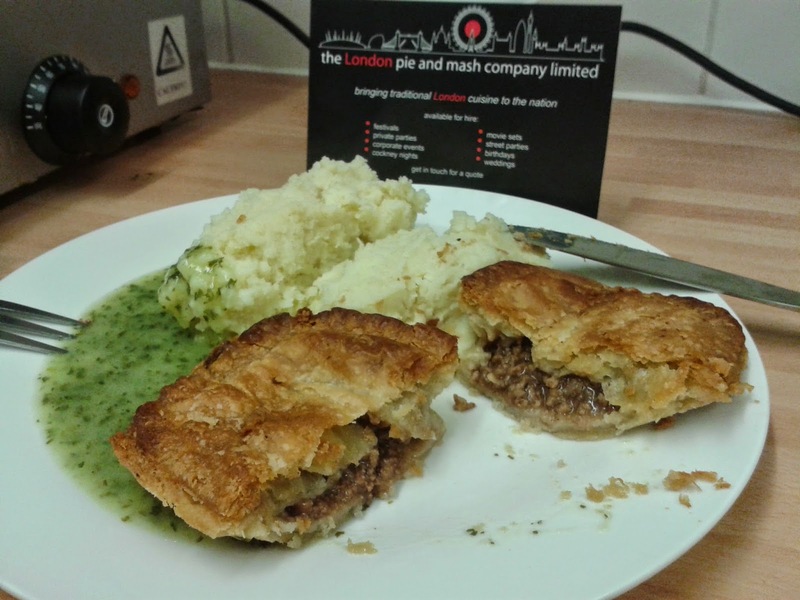 While there was unfortunately not time to work out whose homemade pie won in the end, I think we can all safely say that ‘everyone was a winner’ after an evening of fabulous pies from The London Pie and Mash Company and our home bakers!" Here’s to many more fun pie nights ahead! continue reading "Pierate’s 5th Birthday Pie-rty"
Big Pie Party for the Pierateers! We're celebrating the big '5' with a big '6-0'! Yes that's right - this Saturday 22nd November we'll be celebrating our 5th Birthday by eating pies along with over 60 of our pie pals! We'll all be enjoying a traditional pie and mash dinner from The London Pie and Mash Company and seeing what our guests bring for dessert. Chris is going for gold! Ins-pie-rational! I do hope we'll be tasting a 7/7 from you soon Chris, can't wait! Thanks for the international pie advice Steve! As you know, we're trying to find the best pie in the world, not just in the UK. So when we head abroad, such as on Greek Pie Tour in this case, it's very helpful to receive suggestions. In a blind tasting, Wahaca founder Thomasina Miers rated Lidl's Snowy Lodge mince pies as her favourite on the high street. And guess what, the web's premier pie rating website has also rated Lidl's Snowy Lodge offering as the highest scoring supermarket-branded mince pie on the high street (so far)! If you visit our interactive pie rankings table and click on 'Mince', you'll see that Lidl comes third after Robinson's Bakery and, of course, Mr Kipling. 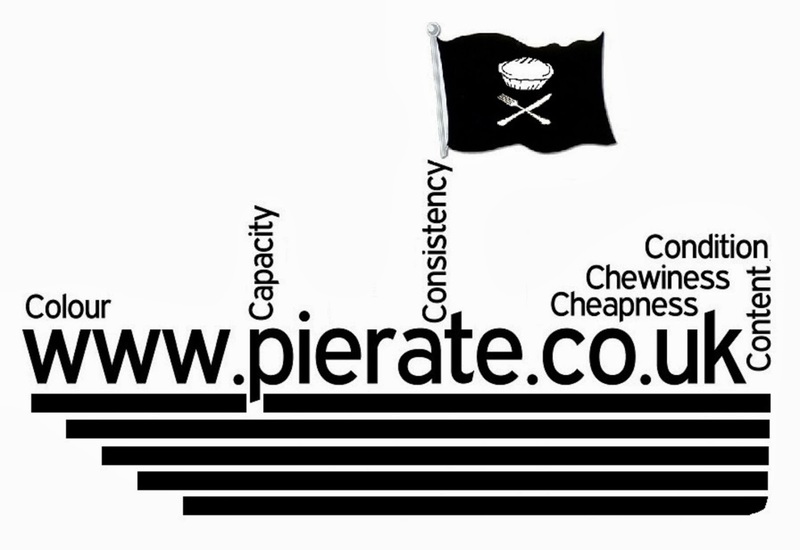 Look out for some mince pie rating on Pierate soon! continue reading "Let's All Have A Party! - Friday 21st November - Pieday Friday"
In what's become a yearly tradition (okay, so I've now done it twice...) I headed in to what is probably one of the most - if not the most - famous stores in the world, let alone in London. Getting off the tube at Knightsbridge and quickly darting in from the downpour outside, I plotted my route to the Harrods Food Hall. I was in for a bit of a sur-pies! For where I had picked up a pie during my visit a year ago, I saw in front of me probably the world's most expensive shepherd's potato bake (that's a shepherd's "pie", if you're not familiar with the term...) at a jaw dropping £47.60!!! But don't worry pie fans! You're not going to see the first ever potato bake reviewed on Pierate! Oh no! A bit further round the hall I found my golden treasure, fully encased in pastry. Interestingly they had expanded their range a bit and started selling a 'hot pie and mash' option, in addition to now selling Pieminister pies (which you've no doubt seen sold in local supermarkets and some pubs). 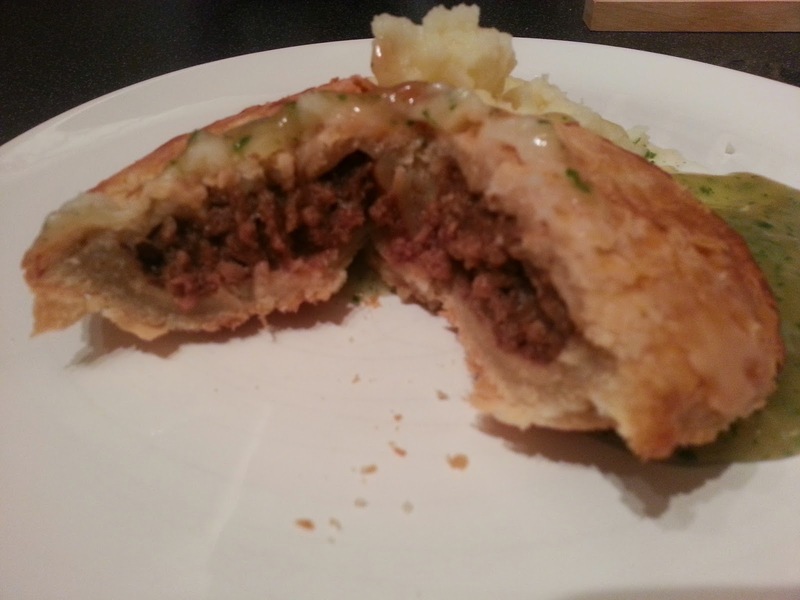 You won't be surprised to know we've got quite a number of Pieminister pie reviews on Pierate. Read about the Harrods Luxurious Mince Pies we rated last year, which featured in our '12 Pies of Christmas’ music video! But the pie I picked up was from a company I hadn't heard of before - Essex Larders. The pie was a chicken and herb pie, sold cold in pork pie style with jelly and a large filling. 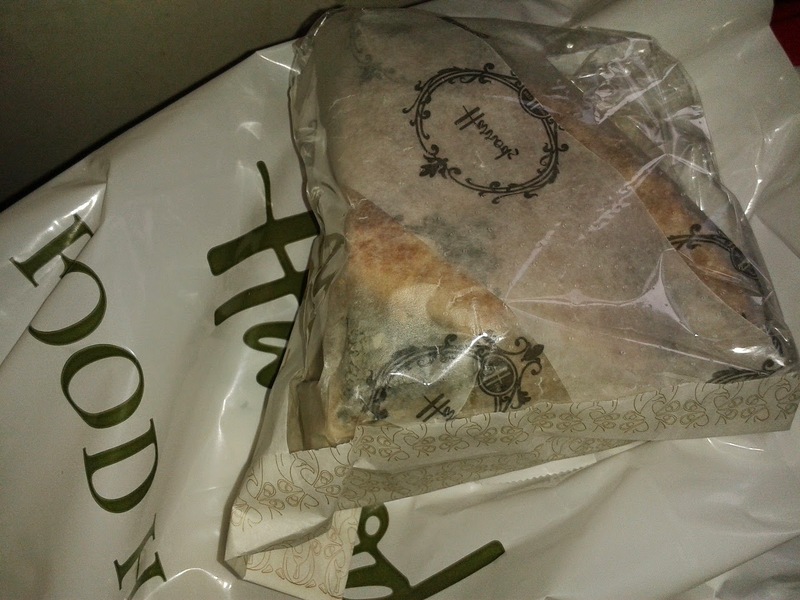 It was quite a substantial price at £2.50 per 100g or £9.80 for the piece photographed, but then again expectations (and prices) are high at Harrods. I bought enough to have 4 reasonable slithers - with my housemate Jeremy and friends Laura and Amy. Biting into it, the pastry was crisp but not too thick. The filling made up the vast majority of this pie, with a reasonable slither of jelly and quite a thick central herb layer. The chicken was tender and the herbs blended well with it. Altogether a very nice pie, though the jelly was a bit overpowering in my view and there could have been a few less herbs v chicken. The condition was good and I'd happily eat it again, though the price tag may well put me off purchasing it. But then this is Harrods! 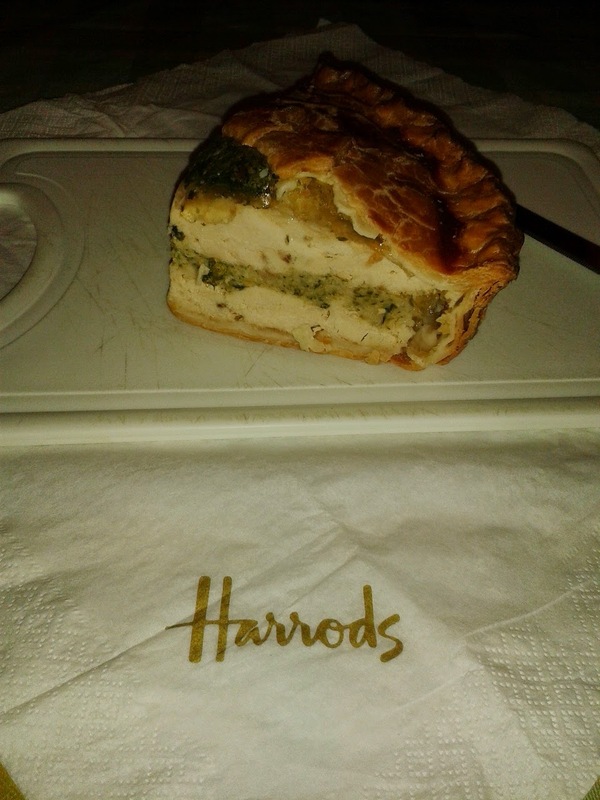 continue reading "Are Harrods Larders filled with top Essex pies?" It was #InternationalPierateDay, so it was only right that I had a double-pie for dinner! 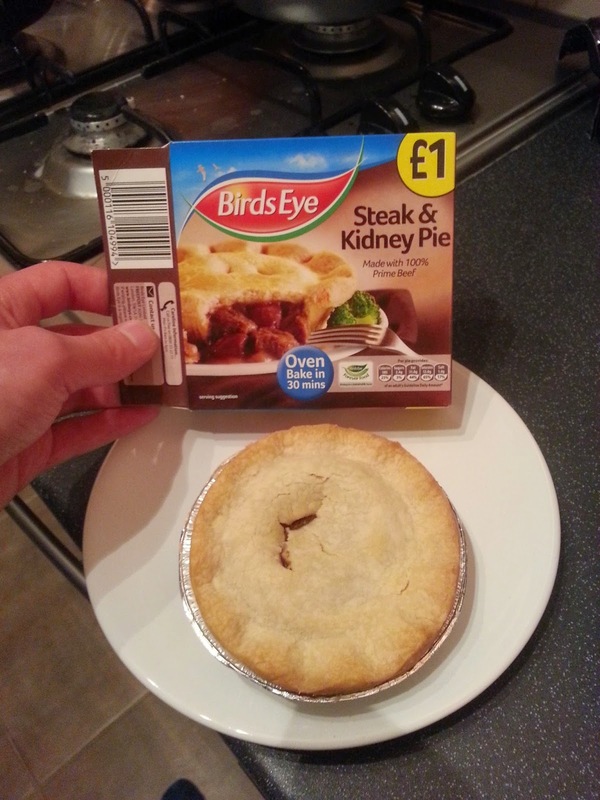 First up is a pie that my esteemed colleague Pierateer RAS has already reviewed - a Bird's Eye steak and kidney pie. 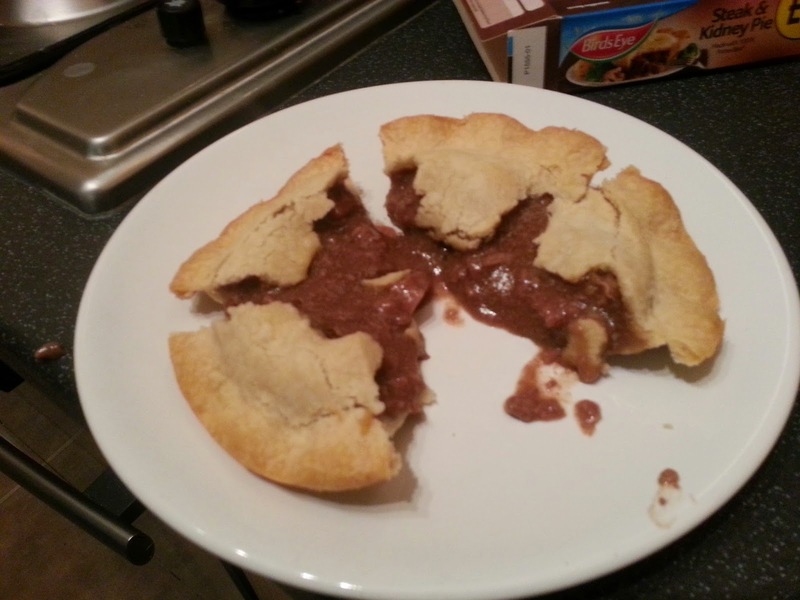 However, while RAS seemed to have quite a satisfactory experience with this pie, my experience was not quite the same. The pie just collapsed and fell apart as I cut into it. However, I'm willing to accept that perhaps my friend's oven wasn't up to the task of cooking this pie. Although I put it in the oven for the allocated time, this was my friend's oven so perhaps I'm not used to how it cooks. Also, the lack of golden colour on the pie would suggest it might be underbaked. However, regardless of that, I did find the filling lacking in any decent chunks of meat - it was mostly gravy, and didn't taste particularly nice in my opinion. I won't rock the boat by re-scoring this pie (as the venerable RAS has already fulfilled this duty) - but let's just say, I personally wouldn't buy this pie again. Now onto dessert - and a pie we haven't rated! 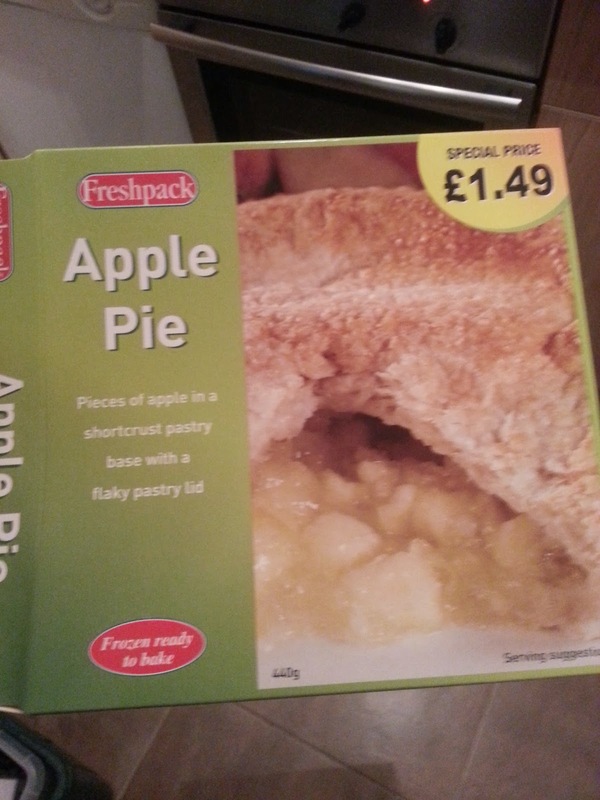 A £1.49 large apple pie from Freshpack. This is a decent price for a large pie. On cutting into the pie, I can see just how shallow this pie is. In my opinion, the filling isn't the best of quality - it seems rather sickly sweet, and it's small jammy chunks of apple are quite distant from a quality hand-made affair. The pastry is a bit bland, a tad chewy, and doesn't have that nice flaky texture. Still, I shared this pie with two friends and we all quite enjoyed it (and it got eaten pretty quickly, so that's a good sign). In short, this pie is cheap and friendly, but its shortcomings are fairly obvious. continue reading "Mistake and kidney; and the apple of my pie"
continue reading "Help take Pierate to the next level in just 5 seconds"
As you'll no doubt have noticed here on Pierate we really do enjoy rating pies - so much so that we have over 425 in our Pie Rankings at present and many more to add to it in the next few weeks! But did you know we've been rating pies for 5 years now?! Yes, from that first post back on 12th November 2009 to the present day, we've been rating pies on the 7 Cs of pie rating and we did precisely that on Wednesday 12th November 2014! For we have designated this day "International Pierate Day" and you can read about the day and see our commissioned art work by @michlan in our International Pierate Day 2014 article! In addition to encouraging you all to eat and rate pies on 12th November, Pierateer RAS also decided to try and solve the question of why shops sell mince pies before December?! To help him ponder this, he ate a mince pie for every meal that day and you can read the results here! You may not realise this but we're not just sailing the 7 Cs of pie rating to find the best pie in England or even the UK! We're looking for the best pie in the World!!! As such, when we visit a new country we are always looking out for a pie-tential golden pastry treasure just waiting to be unearthed! And with Pierateer RAS heading out to Athens for the week, he'll be in search of any Greek Pies on offer! Full reviews will be coming soon, but in the meantime check out his reasonably successful "When in Rome..." Pie Tour from this time last year! Yep... so this week we had a tweet from Jamie Oliver. THE Jamie Oliver! And while we were disappointed to see him promoting a top crust recipe on his twitter account, we did aPIEreciate him admitting that a proper pie has to be fully encased in pastry when he was picked up on it by our pie friend Chris! Chris had just teased Jamie that he needed help, as a true pie needs pastry all the way round! Couldn't agree more Chris - see our definition of a true pie here! You don't need to hear us banging on again about how we were on TV on the Great British Bake Off: An Extra Slice. But excitingly Paul Sykes, the founder of Paul's Pies and maker of our current number 1 and number 3 pies out of over 425 in our pie rankings is going to be appearing on BBC Two tonight (14th November). He shall be featuring with chef Tom Kerridge on his current TV show "Tom Kerridge's Best Ever Dishes". We look forward to seeing him on there! And if you want to know a bit more about Paul and his pies, see our interview with him when we awarded Paul "Honoury Pierateer" status last year. 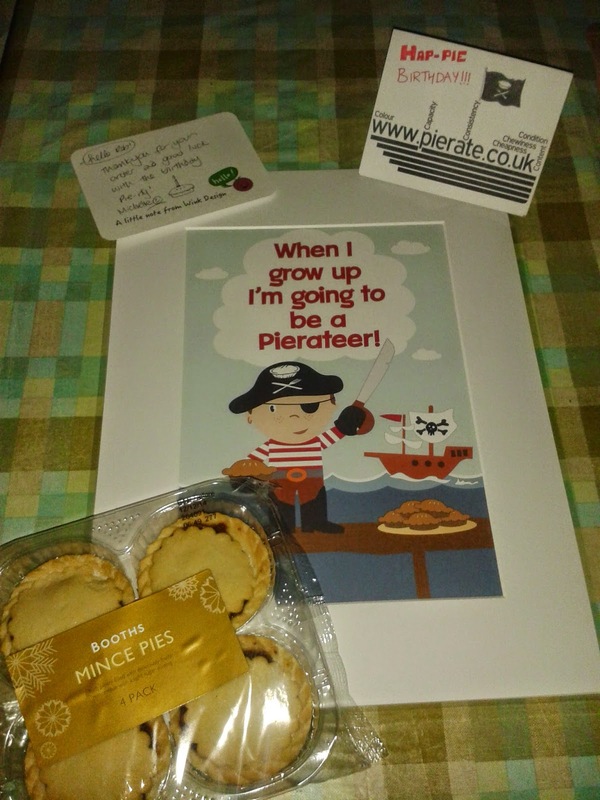 continue reading "Pierate Birthday Celebrations - Pieday Friday - 14th November 2014"
continue reading "International Pierate Day 2014 - Mince Pie with every meal"
Today the Pierateers of pie review website www.pierate.co.uk celebrate their 5th Birthday! So naturally we thought what better way to celebrate than to eat a pie and rate it?! It follows in the footsteps of the very first International Pierate Day last year. But we don’t want you – pie lovers worldwide – to just sit at home and watch as we eat all the pies! Oh no! Pie eating and pie rating is something we can all enjoy. Something that can bring friends, family and communities together. Pies are celebrated and eaten in so many countries worldwide and so today – marking our fifth birthday – we would love you to join us in eating and rating pies with us! 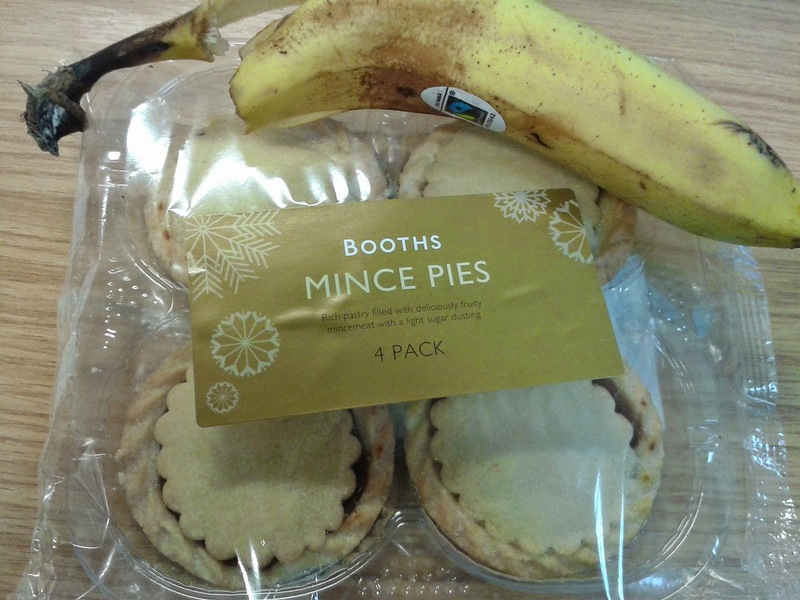 This International Pierate Day we're looking to solve a pie mystery that has bamboozled shoppers for years... Just why do shops sell mince pies before December? 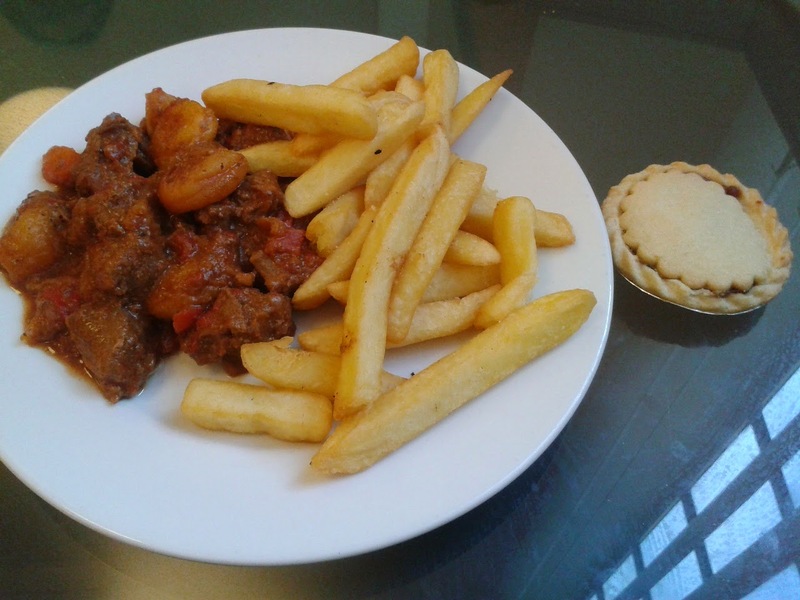 "International Pierate Day 2014 - Mince Pie with every meal"
Well, first things first - you need a pie (or two!) For insPIEration, you might find our Pie Rankings - of over 425 pies we've rated and reviewed over the past 5 years - or perhaps you'd like to narrow it down to our 'Best Pies in London Restaurants'? 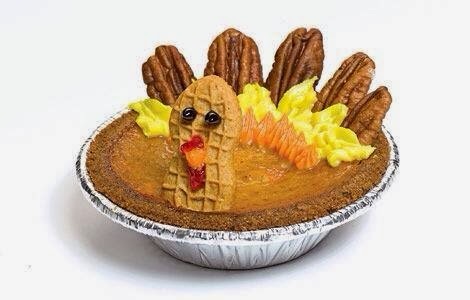 Most of all, we hope you enjoy eating and rating pies today! We sure will!!! 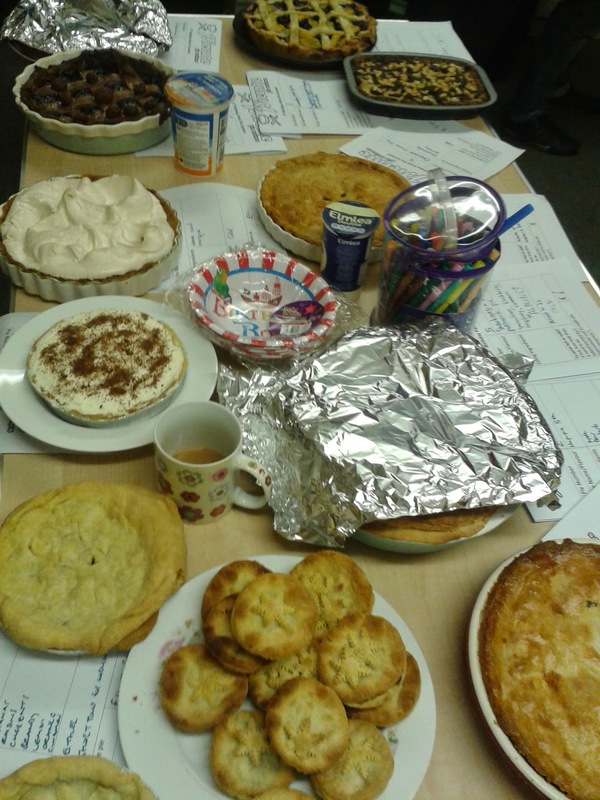 continue reading "International Pierate Day 2014"
It is time for another pie review! Now, I was perusing the freezer aisle of a medium-sized independent supermarket, knowing this was the ideal place to pick up some unreviewed pies (I think we've reviewed most commercially available supermarket pies now). 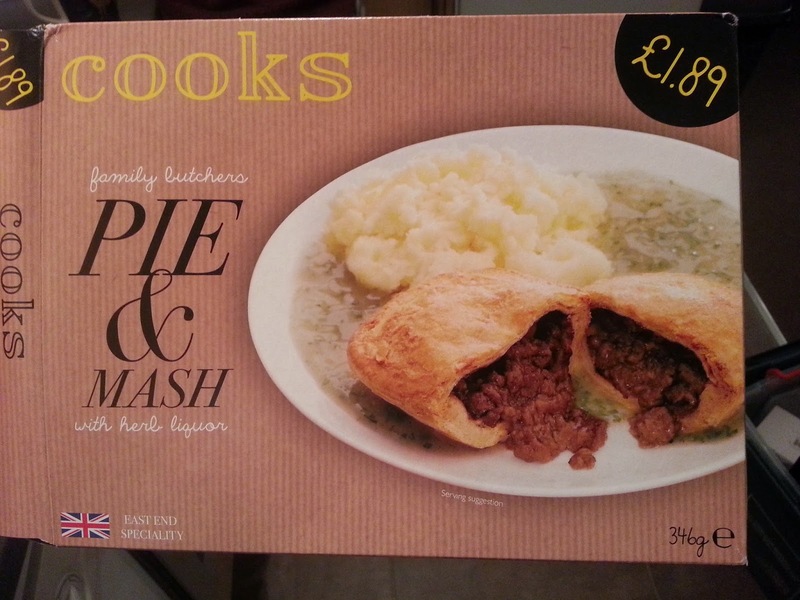 I came across this little package - a 'Cooks' pie and mash! Ooh, Cooks, that's not a brand that we've tried before, this could be quite good! 'Family butchers'! An 'East End Speciality'! 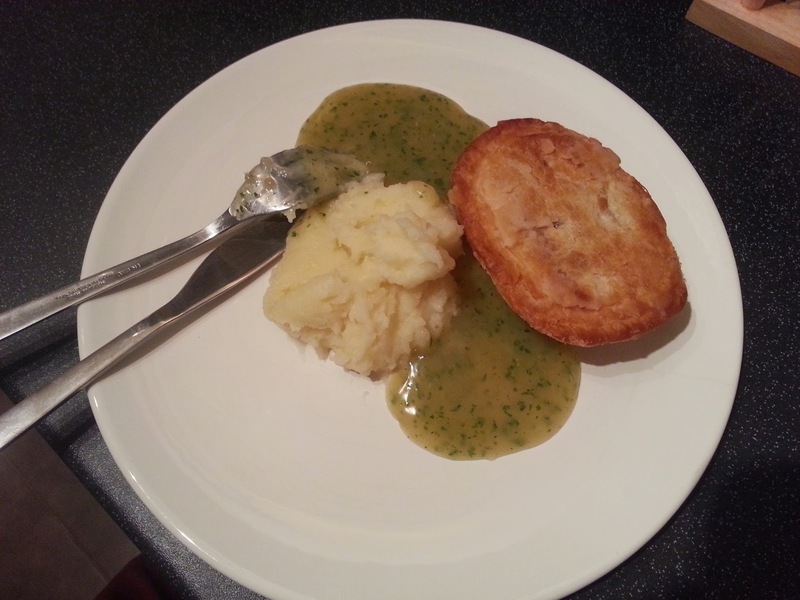 Only £1.89 for pie, mash AND herb liquor! But then I flipped the pack over and my heart sank a little. It was a Kershaws. Readers of the blog will know that I've tried a couple of Kershaws pies in the past and found them rather...disappointing. Their segmented microwaveable packages never seem to live up to the appetising picture on the box, and while they're cheap they are not very filling. The condition of the pie is pretty dismal, presented like a limp rectangle in an oversized plastic packet. After some time in the microwave, the pie and mash is ready for serving. Blimey, this is quite a stingy portion! It barely takes up half of my regular-sized plate! It doesn't look too bad though, considering it's a microwave job. 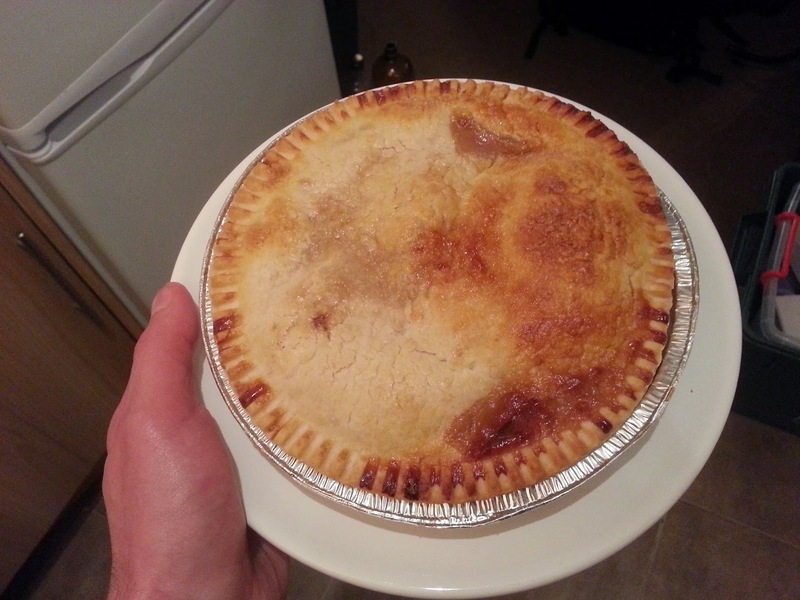 The pie at least has a reasonable golden colour, and it is actually fully encased in pastry. On slicing the pie open, I note that pie is (perhaps surprisingly) rather well filled. I mean, I suppose I shouldn't be surprised at that considering how small the pie is (there wouldn't be any room for an airgap without the pie being virtually empty), but it's still pleasing to the eye. Since I microwaved this pie, it's a given that the pastry is going to be chewy and not at all crispy. What I am pleasantly surprised at is how nice the liquor is. It does seem to be genuinely herby. The pie, however, has little going for it. The meat filling isn't any special, and the whole thing is just so small and miserly. In summary, this pie is edible, and I do believe it is the first time I've ever seen a traditional pie and mash in a supermarket so thumbs up for originality. The best part, in my view, was the liquor, but this pie is tiny tiny so even at the low cost of £1.89 this pie isn't a steal. 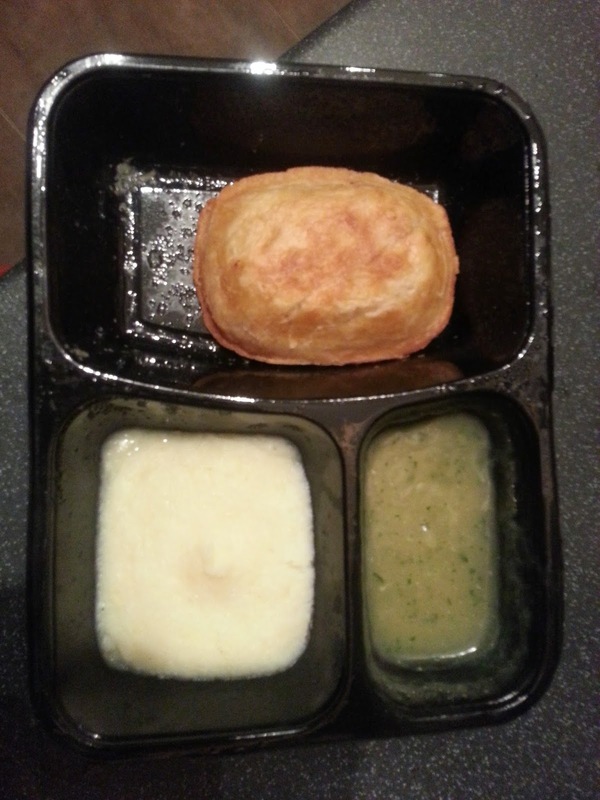 continue reading "Frozen microwaveable pie and mash...what could go wrong?" continue reading "Pre-pie-ration for Pierate's 5th Birthday!"